In small bowl, beat mayonnaise, yogurt, vinegar and garlic with wire whisk. Stir in blue cheese. Cover and refrigerate at least 1 hour. Just before serving, arrange greens on 4 salad plates. Top with remaining salad ingredients. 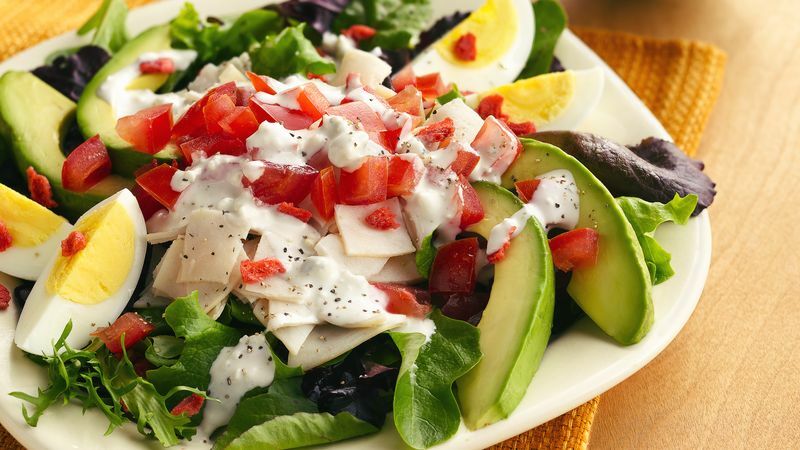 Drizzle dressing over salads. If desired, sprinkle with freshly ground black pepper. Short time? Purchase hard-cooked eggs from the salad bar in your local supermarket. Garnish salads with additional crumbled blue cheese.